As EcoMotoringNews.com reports, some creative Tesla owners came up with a way to make a few bucks from their parked EVs: Cryptocurrency mining. This raises questions that shouldn’t just be aimed at bitcoin mining, or even electric vehicles. For those unfamiliar, cryptocurrencies only work because there is a network of distributed computing that processes the transactions. To reward those offering the computing power, cryptocurrencies give fractions of new bitcoins to those who did the work of running the network. This is referred to as “mining” bitcoins and other cryptocurrencies. This was an expensive and power-hungry task that could wear out computer components much faster than usual. Initially, many doing this used high-end graphics processing units, but as the money earned per device diminished, miners turned to specialized computer units, called ASICs, to do the task faster with less electricity. But the units are still not free, and they still can use kilowatts of electricity for a handful of them. To reduce the overall cost of running mining computers, some miners put the computers throughout their homes to act as small space heaters and reduce their heating bill. Others run their rigs on solar panels to avoid a monthly power cost. Is it stealing to use the power for something other than driving? On the one hand, this could be a good way to offset the cost of owning an electric vehicle. On the other hand, it lowers the efficiency of the vehicle and increases the environmental impact. But then again, the mining was going to be done somewhere anyway, so does it really? Will many EV owners do this? Will they do it at places they were going to charge anyway, or will there be opportunistic fleets of EVs blocking up charging stations to make a quick buck? How will charging station owners respond? But really, these questions shouldn’t just be aimed at bitcoin mining. Computing power is going to be in higher and higher demand going forward. 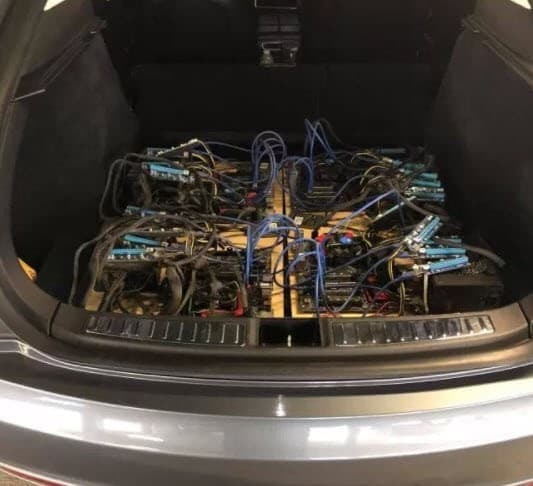 Self-driving cars are already running on graphics processing units like bitcoin miners once all used. Infotainment systems are getting more and more powerful, and that power needs to come from somewhere. Mobile devices used by passengers are going to need more and more power to charge. Even beyond that, there are “V2H” systems that can run a house on an electric vehicle’s battery, and that goes far beyond the tiny bit of power needed to run a few mining computers. And these questions shouldn’t just be applied to electric vehicles. Many of these power strains will apply to hybrid, regular gas and regular diesel vehicles. Alternators, the parts that charge most car’s 12v batteries, are already a big part of the car’s fuel consumption. Ecomodding hobbyists have gained as much as 15 percent fuel efficiency by removing them, and that amount is only going to grow as more demand is placed on it. Some companies are suggesting waste heat recovery to generate the electricity needed for the future. When we look at these wider power issues, it becomes clear that bitcoin mining is just a drop in the bucket. Even if a large number of EV owners did it, it would still be nothing compared to the other computing future cars will eventually be doing. Where that power is going to come from is a good question we shouldn’t just be aiming at the odd bitcoin miner. The reason this article was written and published (while informational and educational) is strictly about timing. There is a reason that Bitcoin is over 10k. In actuality some Bitcoins by their very own crypto currency identifying markers make them far more valuable than others. Value is in the eye of the beholder. How do you kill the profit value of war...? Make oil poison to the value of Bitcoin or any crypto currency generation. Anyone can "mine" for Bitcoin but can anyone setup their own printing press without an IRS "approval"..? What effect will EMP attacks have on Bitcoin?